Sizzling Hot Deluxe is a game made by the company Novomatic. This is a company that operates in the field of gambling since 1980. It’s responsible for the creation of a number of slot games, among other things. 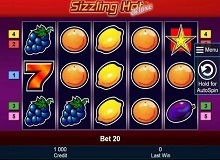 Sizzling Hot Deluxe is one of the simpler slots that you have ever played online. It has that old-school style that you can see in the older versions. There is not much to say about the theme other than it evokes the feeling that you’re in a classy, retro casino. Every time you will spin the reels, you will hear a cacophony of tones. Every time you win something, you will hear a catchy melody of cash registers operating. The number of pay lines in the Sizzling Hot Deluxe game is five. There are three rows inside the five reels. Below you can find out some of the details about Sizzling Hot Deluxe. How to Play Sizzling Hot Deluxe? 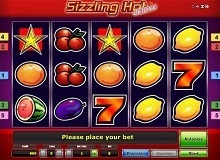 The first thing to do when it comes to playing Sizzling Hot Deluxe is to select your bet size. If there’s one thing that’s rather unique – it’s the fact that you can vary your bet significantly. If you’re risk-averse, you can make a bet of 1 coin on the 5 reels. The lowest bet is 5 coins. Of course, the number of pay lines is fixed – you cannot vary it. But where things get really interesting is the maximum bet. If you play Sizzling Hot Deluxe slot machine online, then the maximum bet you can place is 3,000. This means that the maximum bet on the 5 pay lines is incredible 15,000 coins. This can bring you a lot of winnings if you’re lucky enough – and big losses if you aren’t. The “7” is the most powerful symbol, and it can win you a lot of money with a winning combination. The Scatter symbol comes in the form of a golden star. The difference between the scatter and the regulars is that the Scatters pay out even if they aren’t located on the pay lines. This isn’t the case with the others. Apart from the Scatter – there really isn’t any other special feature in Sizzling Hot Deluxe casino slot online. 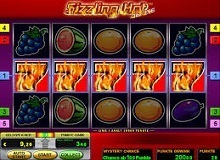 There are a few features that you can use in order to make big wins at Sizzling Hot Deluxe slot. The first feature is the gamble feature. You can use it to gamble and double up your winnings. In the gambling section, you will need to pick a card – either black or red. Then you need to stop the changing of the cards – if the card is of the colour that you have picked, it means you’ve won the gamble. You can then decide to double up again or to take your winnings. It’s important not to get too greedy with this as you can lose big money with this feature if you aren’t careful. Then you can also use the autoplay feature while you play Sizzling Hot Deluxe for real money. This means that you can select the number of autoplay spins that the game will go through before stopping. You can do something else while the game plays itself out. The RTP rate is set at 95%. This is the standard in online gambling – the rate is neither attractive nor bad. 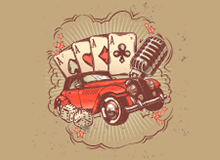 The casino maintains a long-term edge over the players of 5%. It’s a rather dull way to spend your time when you think about it. There aren’t any special features that will be well worth your attention. What we recommend is you to find a Sizzling Hot Deluxe free version that you can try out. See if you like it – perhaps, you will. We still maintain that most people won’t be captivated by this game. It’s simply not interesting enough. But for what it’s worth, we hope that you will at least give it a chance and try it out.